Red velvet yogurt cupcakes topped with a chocolate glaze. 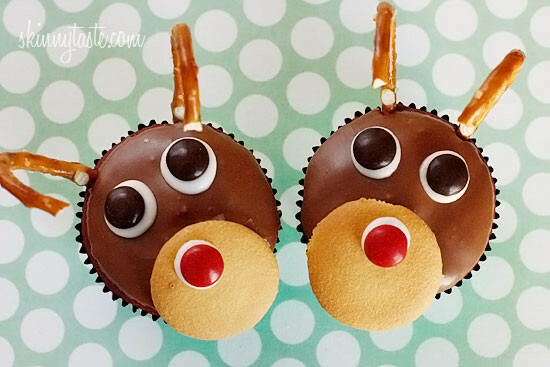 These festive reindeer cupcakes are easy to make perfect for a Holiday party! Some delightful holiday treats to go along side these cuties are Peppermint or Chocolate Meringue Cookies, No Bake Chocolate and Peanut Butter Cookies, Vanilla Snowman Cupcakes and Gingerbread Man Cookies or even Christmas Trees! I saw these cute cupcakes on Pinterest (yes, I’m addicted) and knew I wanted to make them. After great success with my snowman cupcakes, I knew I wanted to make them with Greek yogurt again. Super easy, I used a box of red velvet cake mix, fat free Chobani yogurt, egg whites and water. Does it get easier than that? You can use any flavored cake mix… chocolate, butter, devil’s food cake, etc. as long as your boxed cake mix is 18.25 oz. Oh, and Chobani now comes in 32 oz holiday containers, I’m giving away THREE cases away to THREE lucky winners. If you are interested, enter here for a chance to win (ends Saturday)! I’ve included the nuritional info with and without the candy because realistically you probably won’t eat the antler’s and nose… or at least I wouldn’t. I’ll leave that up to you. Combine all the cake ingredients in a large mixing bowl and beat until combined. Make the chocolate glaze: whisk all the ingredients in a medium bowl. Keep the chocolate glaze in the bowl. Make the vanilla glaze by whisking all the vanilla glaze ingredients in another bowl. Place vanilla glaze in a piping bag. 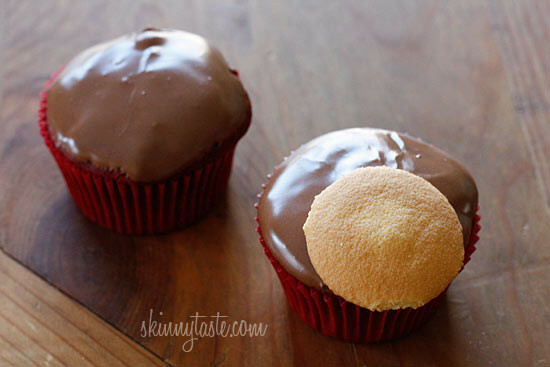 Dip the tops of the cupcakes into the chocolate glaze and quickly press the vanilla wafer onto the bottom of each cupcake. The chocolate glaze will dry fast so you want to make a few at a time. Let the glaze harden at least 5 to 10 minutes. Using the vanilla glaze, pipe 2 circles for the eyes and press the chocolate m&m’s into the glaze. Pipe the vanilla glaze for the nose and press the red m&m onto the nose. Then insert pretzel pieces for the ears and they are complete. 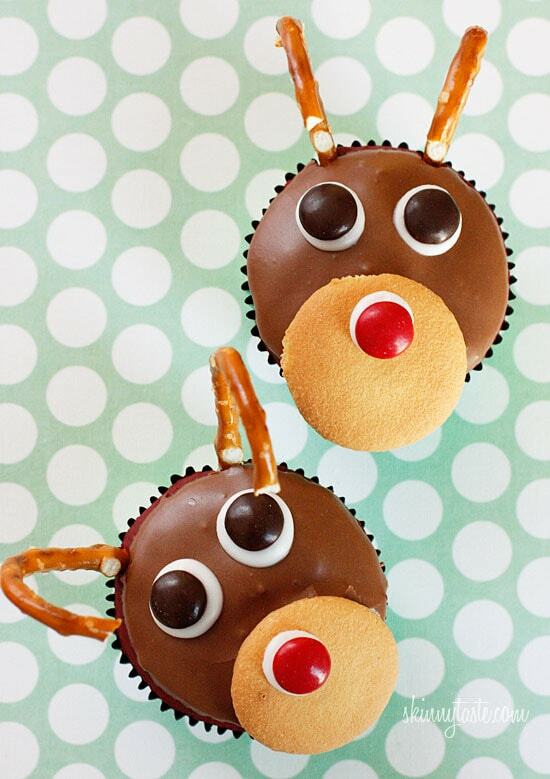 These are cute, but I don't have any need for 24 cupcakes (dinner is only for 6) and I would also have a ton of pretzels, m&ms and Nilla wafers around after (which would end up getting eaten or thrown out). They look so cute though, but not practical. I'm happy to report that, despite not being able to find the 18.5 oz cake mix that the recipe is based on, it still turned out well. I followed the recipe as written with one exception — I reduced the amount of water slightly. I think I ended up using between 1 1/8 cups – 1 1/4 cups. I just kept adding until it looked like a nice consistency, liquidy but not too runny. I was afraid to use the whole 1 1/3 cups since I thought that might make it too runny with the smaller amount of cake mix. I can't compare to the original recipe, but these turned out very nice — moist and spongey. Paired with the light cream cheese frosting, they were perfect for my friend's birthday party. I want to make this a cake, would it work fine too? Let me know, thanks! I want to do this too, Gina?? How many points is it without the chocolate glaze? I made them for a holiday party but had quite a few left over. I brought the rest of them to another office. They seemed to be very popular but everything got soggy pretty quickly. I would suggest only frosting and creating the cupcakes a very short time before serving them. They were very cute but red velvet is not my thing. I would make them with a different flavor cake mix. Umm make sure you don't buy the MINI vanilla wafers…that's what I thought small meant and they are almost too small and make them look like bears (without the antlers). I medium bag of M&M's will yield a decent amount of brown ones, but the red are harder to come by. Red are the least mixed percentage wise into a typical bag. These are absolutely adorable – and they don't seem uber complicated to make, which is awesome. Definitely something I'm going to have to keep in mind, thanks! These cupcakes turned out so yummy. I used vanilla Chobani instead of plain. The cupcakes were nice and moist and I only kept them in for like 22-23 min. Highly recommend these cupcakes! These were a huge hit at our Middle/High School Youth Group. I don't know who had more fun my husband and I making them or the teenagers eating them! 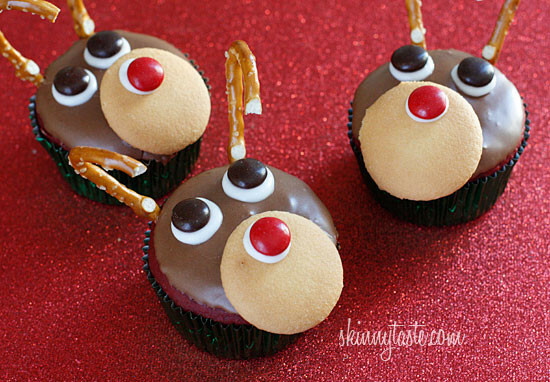 These are very cute, but very messy to make – the chocolate glaze ran down the sides and most of it off the top of the cupcakes. I think I would use chocolate frosting if I made them again. Gina, these are just brilliant, thank you so much for this blog. Happy Holidays to you and your family! How cute are those!? And anything red velvet is a winner in my book.. So excited to make these! Thank you so much for sharing your ideas! 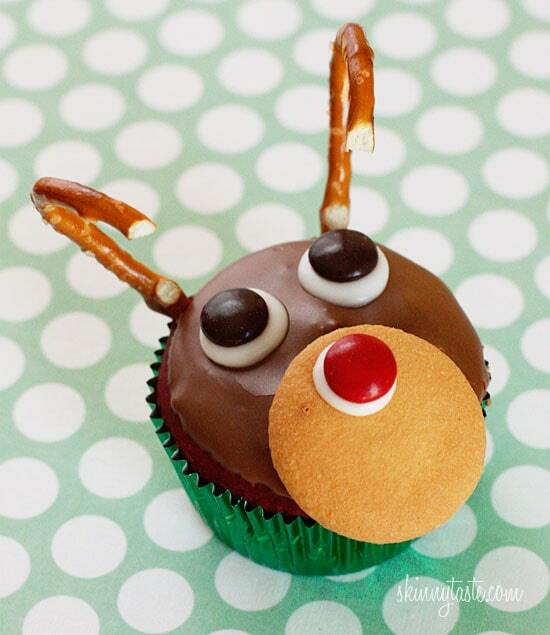 You have made me the coolest mom this Christmas- I am not a baker or very creative but even I can do these! Thanks. Can't wait to make these!! Thank you so much! @joyfulartist Greek yogurt is fat free, very high in protein and low in carbs and sugar. It is a great sub for sour cream. My little one loves sour cream and can't tell the difference. And you can bake with it. As you can your French style yogurt but since you can't taste it, your better off with Greek. Its a healthier option. And its great in smoothies! These are full size but you can easily make them mini too! They would be so cute. Are these mini-size cupcakes or full-size cupcakes? I can't really tell from the recipe or picture. These look awesome. I think my little niece would love me even more if I made these for her. thanks for posting. I will have to try for sure. Approximately how many bags of M&Ms will yield 24 red and 48 brown M&Ms? Is there a way to find these colors without clearing the candy shelves? I haven't used M&Ms in decades so am ignorant about whether they come in selective colors now. Thanks for your advice! There so cute!!! I love the wafer cookie on his adorable face! Looks good, but I'm curious, why would you decorate the cupcake with candy and then not eat it? what will you do, pick it off and toss it out? seems like if you're going to eat a cupcake you may as well eat the extra cookie and single M&M. Ahh!! How cute are those! 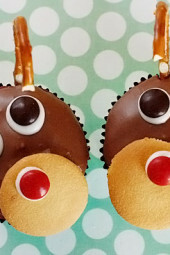 If I get crafty, these might get added with the nutella fudge I'm already bringing for Christmas. These are so super cute – my daughter would love these! I don't get all the rage about Greek yogurt. I've tried to like it and I just don't. I've gone back to my French style yogurt which is smooth and creamy. I assume it would work just as well. Aren't they cute! 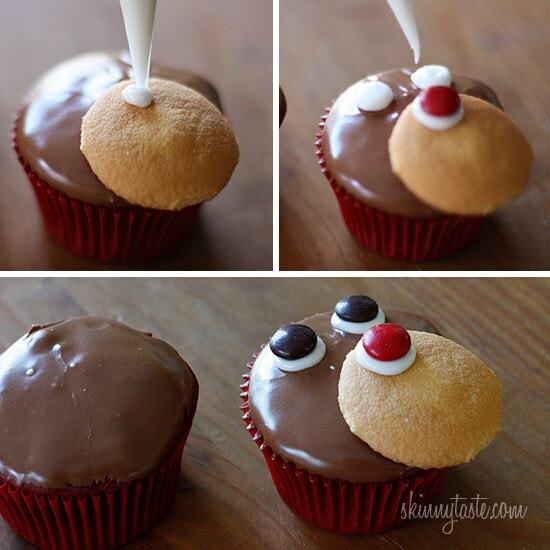 You can even make the basic cupcake recipe without the extras for a quick low fat cupcake. Chi, I used plain but vanilla would work too. Did you use vanilla chobani yogurt–I've never seen a plain in the stores. Those look to good to eat, nice job! These are adorable! Perfect for the holiday season! I am so excited to make these next week for my daycare kids they are going to love them. I will not feel guilty having one either with them being 4pts. I made mini red velvet cupcakes..wish I would have seen this recipe before…ugh…my grandchildren would have loved them. I just made similiar ones but these sound soooo much tastier! These look ADORABLE. Must make them ASAP!